The Bulb Eater Lamp Crusher by Air Cycle crushes spent fluorescent lamps of any length into 100% recyclable material while capturing over 99.99% of the vapors released. The system, which is mounted to a 55-gallon container, can hold up to 1350 4-foot fluorescent lamps. The lamp crusher unit is equipped with a side-mounted dust filter unit containing the highest quality H.E.P.A. filter available. This works in conjunction with an activated carbon filter located in the steel canister. 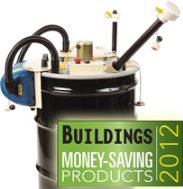 The activated carbon filter actively captures and neutralizes the mercury vapor released from the lamps during crushing. A recent study showed non-detectable levels of escaped mercury vapor even after crushing 1500 lamps. A new safety control panel has also been added, giving the operator added security by monitoring seven aspects of the machine to better ensure operator safety. In addition to providing EPA and OSHA compliance, the Bulb Eater Lamp Crusher frees up valuable storage space normally filled with boxes of spent whole lamps, reduces handling and related labor costs, and typically cuts recycling costs by 50% or more. The Bulb Eater is capable of crushing straight lamps of any length, U-Tube lamps (Model VRS-U only), and even a 4-foot fluorescent lamp in a single second. The product reduces labor by 20 hours per 1,000 lamps, saves up to 50% on recycling costs, and minimizes storage space by 80%.